Oberlin Smith was among the first to conceptualize magnetic recording. Oberlin Smith is most famous as one of the leaders of the mechanical engineering field in the late 1800s, but he is remembered by electrical engineers as the inventor of magnetic recording, the technology used today for audio and video recording and for computer disc drives. He was born in Cincinnati, Ohio on 22 March 1840. As a child he moved to the rural village of Bridgeton, New Jersey, where he lived most of his life. After attending engineering college, he made his first invention, a machine to cut and ream iron pipes, at the age of 23. That same year, 1863, he established his own shop, and was joined by partner J. B. Webb in 1864. Smith and Webb began to specialize in making large sheet metal presses to be used by factories to stamp out small objects. In 1873 Smith founded a new company called Ferracute, which helped create the technology that manufacturers used to stamp out fenders for bicycles and automobiles. In the 1870s and 1880s, Smith embarked on a period of intense inventive activity that was not limited to machine tools. He patented new kinds of looms, locks, an automatic garage door opener, and other things. After the invention of the phonograph, he invented an automatic record changer, a prototype for the first jukebox. Around 1880 he visited Thomas Edison’s New Jersey laboratory. Edison had recently invented both the phonograph and the microphone, and Smith took notice of these. When he returned to Bridgeton he began experimenting with the recording of sound using an entirely new method. It occurred to Smith that sound could be recorded not as a groove in a sheet of tinfoil as Edison had done it, but as a varying region of magnetization on the surface of a steel wire. He believed that solid wire would not work very well, however, and proposed using a string or thread woven with tiny bits of chopped-up wire. Since the bits of wire would not touch each other, they would not cancel each other out. His idea of chopping up the magnetized metal is somewhat like the modern practice of coating metal powder on a plastic base, which is how audio tapes, video tapes, and computer floppy discs are made. Smith was the first to propose using magnetism to record sound and his ideas and invention set the stage for later developments like the telegraphone. Whether Smith actually constructed the recorder has never been proven, because most of his records were later accidentally destroyed. In 1888, Smith decided that he would never get around to patenting the magnetic recorder, and he offered the idea to the public on the pages of the engineering magazine Electrical World. Smith’s fame as an engineer continued to spread after he left the field of sound recording. Ferracute became a leader in its field, and Smith enjoyed a host of diverse activities. 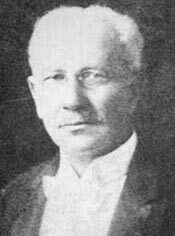 He became the President of the American Society of Mechanical Engineers in 1899, the New Jersey commissioner to the Pan-American Exposition in 1901, director of a local bank, and a member of the New Jersey Department of Conservation and Development. His later career included such varied activities as membership in the National Geographic Society, board membership of the Advisory Council of Simplified Spelling, and Vice Presidency of the Men’s League for Women Suffrage. He died in Bridgeton 19 July 1926. This page was last edited on 11 February 2016, at 15:07.